I am the person I know best. Take a look at some recent project archives! 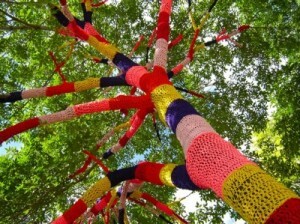 2012… a fabulous fine arts journey in stitches and strings! Strings Around the World was an exciting way for students to explore other cultures, practice traditional fabric arts and learn basic guitar skills rooted in age-old traditions of collaborative art making. Eighteen students (5-8th grade) participated in our program and were able to share with others the three key elements of strings — pattern, repetition and improvisation found in the music and fabric arts of India, Spain and Morocco. Students learned how these cultures are connected yet diverse and how each country, each culture, each region, each tribe and each community of people living together has a rich history of strings. Students learned that the art forms of these cultures, and all cultures, are everyday documentation of our journeys and evolutions as humans. Students demonstrated their knowledge of these understandings through creating original artworks and musical compositions. Their interpretations of these ancient art forms were yet another journey of strings around the world. This broader concept—art as a documentation of history and our own personal journey—was exactly what Ms. Zelle and I were aiming for in this experience. We were extremely happy that students were truly engaged in this project and enjoyed their journey so much! Many thanks to Mrs. Assria-Herrera, Mr. Raman, Corrin Walden and Christy, Anne and Jaime Joy for sharing your artistic talents with us! Special thanks to the Oppenheimer Family Foundation for funding this project! Take a peak at our ART IN ACTION projects from 2010/2011! Kids’ Knitworks Global Outreach Dulaan is the Mongolian word for warm. In the first stage of this service learning project, students spread dulaan/warmth both far and near as they created hand-knit wraps and garments for families in need across the globe and close to home. This multi-age after school project built camaraderie and community among Waters School students as they learned to knit, crochet and work together to help a variety of communities in need. We promoted global citizenry and broadened our concept of community by creating action-based artworks to help others. Each month, students learned about a distressed target community including displaced and impoverished families in Mongolia, earthquake victims in Tibet, first-time women and girls going to school in Afghanistan, HIV/AIDS orphans in South Africa, seriously ill and traumatized children in Illinois and elderly men and women on fixed incomes in Chicago. We utilized historical knowledge and current events to learn about these communities as students build knitting skills. Our partner organization in Mongolia was The Dulaan Project. Students were thrilled to see photos of the scarves they had created on their new owners in Mongolia! Thank you to all of our Waters School volunteer knitters! Additionally, in the second stage of our project, students learned about the contemporary “yarn bomb” movement in the USA and discuss its distinction as surprising knitted street art made to “warm up” public spaces in an ecologically-friendly fashion. We practiced a bit of yarn bombing around our school and grounds, including knitting a tree cosey (a yarn doily around the circumference of a tree) around one of our precious 300 year old oak trees to commemorate our school’s 100 year anniversary! Special thanks to the Oppenheimer Family Foundation for funding this project! Check out our highlights from 2009/2010! Uthando is the Zulu word for love. In this service learning after school project we became doll makers, creating fabric dolls that were donated to the KwaZulu Natal children of South Africa. One in five KwaZulu Natal children have been orphaned due to disease and poverty. Many of these children do not have toys or dolls to play with. We loved feeling like we made a difference in the daily lives of some of these children by sending our dolls, made with our love, to them to play with. The purpose of this project was to teach students basic sewing and design skills while building global citizenship. Students studied and created a variety of African textile arts (adinkra, bogolanfini mudcloth, adire eleko, kente, Pan-African batik) in order to make culturally sensitive clothing for their dolls for KwaZulu children to play with. REPSSI (Regional Psycho-Social Support Initiative) research states that this support of play in the children’s daily routine will help with many of the bereavement needs in KwaZulu Natal. In support of building cross-cultural understanding, students explored traditional songs and dance, cultural celebrations and folk tales of South Africa in this project. Our goal in Uthando=Love was to create connections and build understandings that reached beyond our after school program. Our Fine Arts Parent Group assisted students by working as a sewing cooperative to create dolls for students to enhance with traditional Pan-African dress and adornments. We encouraged all Waters School families and artists to become involved in this global citizenship project by making dolls at home to be donated to our cause. The original Uthando Project is an organization based in Perth, Australia. We resourced their knowledge base in order to make our donations to the children of KwaZulu Natal, South Africa. 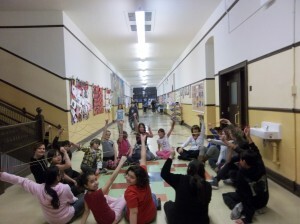 This project was supported by grants from Chicago Arts Partnership in Education and the Oppenheimer Family Foundation. Ms. Beza, Ms.Okulinski-Reyes and Ms. Hutto/Global Explorers Kids collaborated with the art room on this project! Our Parent Ensemble volunteered to help us sew additional dolls to accompany the children’s efforts. Our Book Fair Parents donated children’s books to be sent with our dolls. Thank you to everyone for all of your support! Special thanks to parent volunteers Reyna Rayo & Naomi Fothergill! Thank you to everyone who joined us April 24, 2010 for our Community Uthando Doll Making Cooperative in celebration of Global Youth Service Day. Over 60 Cityyear Corps volunteers collaborated with our community to create as many dolls as we could on this tremendous day of service! Overall, we sent 125 handmade fabric dolls to the children of KwaZulu Natal, South Africa! VENACULAR ART INSPIRED BY SELF-TAUGHT AFRICAN AMERICAN ARTISTS OF 21ST CENTURY SOUTH… OR… WAY-OUT WASHBOARDS! Way-Out Washboards was a Middle School project that looked at outsider, or self-taught, artists of the American South. We were in partnership with Ms. Zelle as we looked at the African American experience of the South in the last century documented by self-taught artists and musicians. We explored vernacular artists and Blues musicians in this study. We utilized homeroom curricular themes such as the elements of fiction as we created stories in word, pictures and sound that document a a personal hero that inspired students creatively. These stories or honor statements were told in sound (using found object musical instruments) and in pictures (using vintage washboards as our “canvases” for our vernacular art). We created a multi-media art installation at the Intuit Gallery in May 2010 that showcased our work. Over 18 Waters School families were able to make it to our Grand Opening Event. Thank you for your support! SHRINKING OUR CARBON FOOTPRINT: CLAYMATION! In Spring 2009 we were busy exploring innovative ways to teach others how to reduce our carbon footprint in Room 302. Our 8th graders designed claymation public service announcements on a variety of topics—driving less, switching to more fuel efficient lighting, planting more trees and GO GREEN (just to name a few…)! Students storyboarded their scripts, constructed clay figures, photographed their work in stop-animation and constructed/edited their videos. This art and technology collaboration was featured at Tech 2009 in Springfield, Illinois in May 2009. Measure your personal carbon footprint here and compare it to individuals across the globe. You may be surprised… http://www.zerofootprintkids.com/kids_home.aspx This project was sponsored by The Oppenheimer Family Foundation. Look at some of our finished projects on Mrs. Termini’s Technology website! We created a journey along The Silk Road and all are invited to check it out! 6th grade students in Room 303 explored The Silk Road via a variety of lenses—music, drama, history, technology and visual arts and planned a culminating showcase for all Waters School students last May. We worked on wikispace journals to teach our peers and document our progress. Students are designed shadow puppet plays that were rooted in the folk tales of Samarkland, Bukhara and many other stops along The Silk Road in art class. We shared our puppet theatre at our culminating event for 2nd-5th graders! Click here to see a video of our project created by a Waters School student in Ms. Termini’s class. This mural is about hopes and dreams. My favorite part of the mural would be being able to paint my face for everyone to see. The symbols the wall represent freedom and hope and love. The worst part of the mural would be that painting is so much work. It takes a lot of time. It’s worth it! The wishes and speeches on the walls represent our hopes for the future. Dr. Martin Luther King Jr. and Harriet Tubman are on the wall because they tie into what we are doing. They hoped and tried to make a better future. They did as much as they could. The states and world represent the planet Earth and all of us. That is what the mural is about…hopes, dreams and the future. 5th grade students shared their hopes and dreams for the 21st century through symbols, patterns and paint in this mural-making project. Students explored the hopes and dreams of African American experience by studying the symbol systems and writings of the Akan peoples of Ghana, the freedom fighters of Early America and the everyday heroes of the Civil Rights Movement. We looked at the power of hope and dreams to create action in daily life in this project. Our understandings and reflections are permanently documented on the walls of our third floor staircase. Students’ personal hopes and dreams are scripted beside our multimedia images in order to turn lessons from the past into change we can all work toward in the future. Special thanks to Patricia Reyes for all of her help with this project and to CAPE for sponsoring our work. Stop by the north stairwell and see our finished product! SCIENCE & SOCIAL STUDIES INTEGRATION:5th & 6th graders explored the Chicago Humanities Festival theme Climate of Concern in our SCALE afterschool program. We looked at Nature—the ultimate recycler (as Mr. Leki has told us)— and thought about the 4Rs—reduce, reuse, recycle and RETHINK. Students explored art cooperatives around the world that take environmental and economic concerns into their own hands by creating indigenous arts to sell to the global community. We combined these ideas to create handmade goods such as paper mache bowls (reusing advertising mailers and old homework worksheets) and reused material rugs (reusing plastic bags, old t-shirts, recycled yarn and fabric remmnants). The Fine Arts Parent Ensemble also created products for our IDay event. Moms were busy crocheting handbags (reusing yarn and plastic bags) and made paper mache bowls and rugs too! We worked together to raise money to benefit Heifer International, Mayaworks and Camino Seguro. Many thanks to Gloria Ordonez for our stunning silk remnants and to Marcy Kollath for e-cycling our many, many, many skeins of yarn! Our five classroom-sized looms for this project were purchased through a grant from the Oppenheimer Family Foundation and we appreciate Mr. Oppenheimer’s continued support of Waters School. SCALE is sponsored in its entirety by a generous grant from Chicago Arts Partnership in Education. Without their support, this programming would not be possible.Very special appreciation to Patricia Reyes-Okulinski and Eileen Ryan, our SCALE Artist(s)-In-Residence extraordinaire, who shared their creative talents with us on this project. A thousand thanks to our fabulous Waters School community for your support! SCIENCE INTEGRATION: In 2006/2007, Middle schoolers created recycled material sculptures for the gardens of Waters School as an extension to our HP Technology For Teaching Grant. We used (safe) e-waste materials, found objects, pottery, tile and concrete to create global citizens to remind us all to “recycle, reuse, reduce and rethink ‘ and take environmental ownership of our planet as we walk through our school’s beautiful gardens. We looked at the current e-waste disposal practices that in effect “transport harm” to other countries (See BAN Network photo (right): Current e-Waste dump site in Guiyo, China.) and study the outsider artist Nek Chand as an individual who transformed in his community through his commitment to recycling and his passion for his art. Look to the HOMEWORK page to learn more about Nek Chand. SOCIAL STUDIES INTEGRATION: In 2006/2007, 5th graders explored what makes a community in our SCALE afterschool program. We looked at the map of our school community and through fieldwork, ethnographic research, music and visual art documented its past, present and future.We planned numerous fieldtrips into the community armed with cameras, sketchbooks and a big sense of wonder. We looked at community icons such as the Chicago River, Sulzer Regional Library, The Cambodian American Heritage Museum (CAHM) and the Governor as well as be captured stories from shop owners and our many neighbors. We started this project by first looking at our own families and asking ourselves what community means to us. We culminated this project with a community exhibit at the CAHM at the end of the school year. Check out the incredible streetside photographic banners that surround Waters School that were a final product of this phenonomenal experience! LANGUAGE ARTS INTEGRATION: In 2006, 4th and 5th grade students, parents, and siblings collaborated to create an interactive mural space on the 2nd floor of the school that documents family history through both image and text. This intergenerational project united parents and children as a community of storytellers who celebrate family stories, cultural folklore and real life experience as a tool to learn about our collective yet diverse pasts, creating a people’s history of Waters School. This project was sponsored by the Oppenheimer Family Foundation. SCIENCE INTEGRATION & CULTURAL STUDIES: In 2005, students were busy exploring the Tree of Life across time and across space as a cultural and artistic metaphor for who we are and where we come from.This project was an extended response to the dynamic study of taxomonies, adaptation and habitat studied with Mr. Leki, Waters School teachers, parents and CAPE artists in the afterschool SCALE arts integration partnership. Students looked at how the Tree of Life has been interpreted throughout time (beginning with Mayan rock art) and throughout the world (Mexico to Mozambique). Students created their own interpretations and created a mural that shares their interpretations with the Waters School community. Take a look at the final product in the community installation space across from the office.